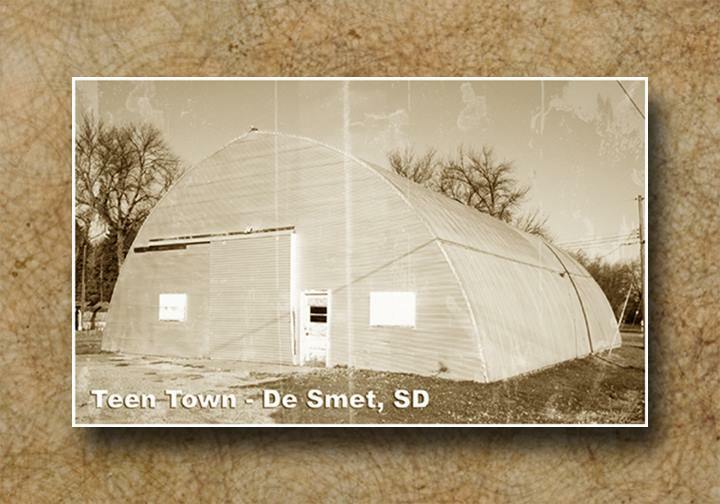 Teen Town began in 1961 when Don McCaskell, a teacher and basketball coach at De Smet High School, and his wife, Janice, leased a quonset for roller skaters. Don’s brother, Ron, ran the Blue Dog Inn in Waubay. Noticing his brother’s success, Don began sponsoring dances at Teen Town. He advertised on KOMA, and kids came from Huron, Brookings, and even Sioux Falls. McCaskell faced some opposition from some parents but was considered by most to be a caring and friendly business owner. Rock and roll bands traveled hundreds of miles to play at Teen Town. The Red Dogs, Spider and the Crabs, the Unbelievable Uglies, the Continental Coeds, and Myron Lee and the Caddies were some of the popular attractions. A four-way stop was created at Third Street and Calumet to help handle the extra traffic. There was always a strong police presence to limit the underage drinking and occasional fights erupting in the parking lot. McCaskell moved to Huron in the late ‘60s to become an insurance agent. He sold both Teen Town and the nearby Cremee Freez (which catered to dance fans) to Jarvis and Evelyn Wallum. Jarvis met with band leaders before the dances. He made sure that they “dressed nicely and played the right type of music,” according to Evelyn. “The Cavaliers (from Arlington and Lake Preston) were one of Dad’s favorites,” says Betty (Wallum) Vincent. They were local kids that were excited to play for a crowd. Managing Teen Town was a family operation. Betty cleaned the building before and after dances, delivered band posters, and wrote stories for the newspaper. Her three brothers helped load band equipment and served as bouncers. Betty’s first date with her husband was at Teen Town. She slyly let him pay for their admission without telling him that her dad was the owner. The dance hall closed in the early ‘70s. Roller skates were taken to Carthage. Jarvis died in 1979. Evelyn, now 91, lives in Brookings. The quonset that housed Teen Town is now a quiet storage building after hosting many loud rock and roll dances. If you mention Teen Town in the De Smet area, nostalgic smiles spread across faces who experienced the South Dakota dance hall.